The British band - which also includes lead guitarist Jonny Buckland, bassist Guy Berryman and drummer Will Champion - will receive the honour from Nordoff Robbins at the 2013 O2 Silver Clef Awards ceremony on June 28. "It means a huge amount to us to be named Best British Act by Nordoff Robbins," said Chris. "Nordoff Robbins is an organisation that lies very close to our hearts. They provide life-changing music therapy for thousands of people each year and we're humbled to collect this award in their honour." 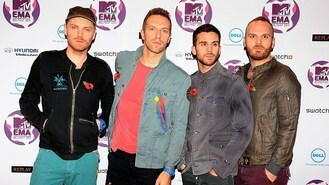 Chairman David Munns added: "Coldplay are one of the British music industry's great successes. With over 60 million album sales and five consecutive No 1 albums, I can think of no band better placed to win the Royal Albert Hall Best British Act Award. They have dominated the British music scene for a decade and their music has influenced a generation." Other previously announced winners include Labrinth, who will be awarded with the American Express Innovation Award, and Alison Balsom who will win the PPL Classical Award. Seven other awards will be presented at the event, which will take place at the London Hilton on June 28.